Every book club meeting I’ve ever participated in has been equal parts conversation, goat cheese, and Shiraz, so it seems to be just a bit of common sense for a food blog like ours to extend itself in the direction of a group reading and discussion project. 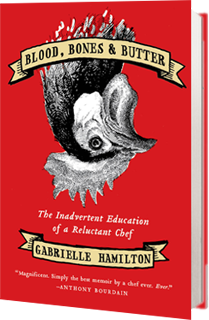 For our first pick, we chose Gabrielle Hamilton’s critic-adored Blood, Bones & Butter: The Inadvertent Education of a Reluctant Chef . We’ll meet back here April 4-8 to chat about the memoir and our (perhaps ill-advised) attempt to get a table during the brunch crush at her restaurant, Prune. If you want to join in the Three Points Kitchen book club BYOB fun, just get reading and meet us back here next week. Can’t wait to chat about this! Just ordered a copy to be delivered Friday.